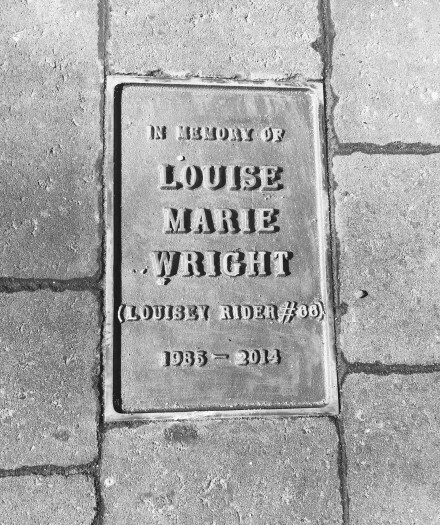 A couple of weeks ago I had the honour of attending the ceremony for a new memorial to Louise Wright, the Nottingham Roller Girls skater known as Louisey Rider #66. Located outside a café near to where the accident that took Lou from us happened, a bench, plaque and – standing a little way down the street – wayfairer, are now a permanent remembrance of our friend. The memorial is, quite simply, beautiful. 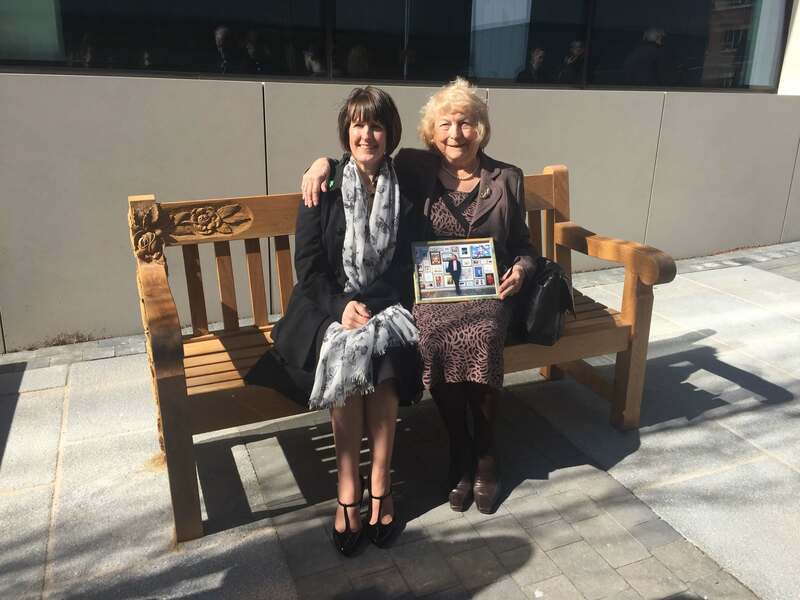 The fact that so many people, from Lou’s company Paul Smith, to the woodworkers who hand crafted her bench with such care, to the council workers who bent over backwards to make sure that a memorial was created, is just another testament to the wonderful woman Louise was, and the impact she had on so many lives, both before and after her death. Of course, the original idea for a memorial came from people we’ll never know. Those amazing folks who, the day after the accident in July 2014, left a ghost bike at the scene of the crash. The bike was in situ for a while, until the council had to remove it as it was causing a risk, distracting people as they drove by. 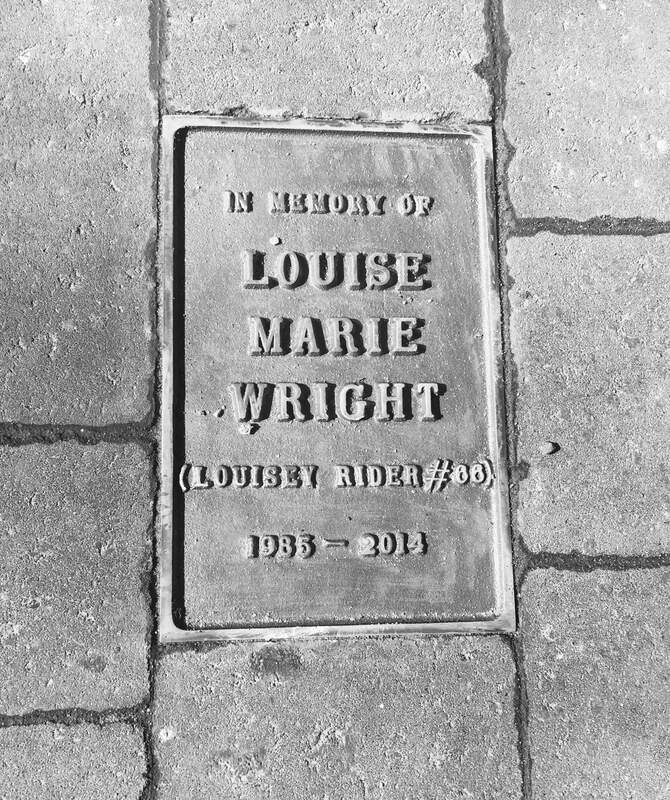 Instead of the bike the council kindly suggested a permanent reminder of Louise, and that’s when the idea of placing something on the new bike route that the council was developing first began to stir. It has been a long time coming but the council, working with Lou’s mum Sharon and her boyfriend James, have created three lovely pieces; the bench and small bronze plaque are situated near to the BioCity café, just off Pennyfoot Street, and the wayfairer is to be placed a little further down from there. Both the bench and the wayfairer have floral detailing, matching that of Lou’s tattoo and the length of the detailing on the wayfairer and width of the bench are both the same as Lou’s height. Though those gathered at the unveiling of the memorial were small in number there was a diverse crowd. A few close friends, family and workmates who had helped to design the pieces. I think most poignant to me was the police liaison officer and nurse who was one of the first to the scene of the accident. Not only did this highlight, to me, the earlier point about Louise touching so many people’s lives but also how amazing Louise’s family have been in the face of such tough circumstances, always acting with such grace and kindness and always injecting just a little of that spirit of Louise we loved so much. As James and Sharon took their places to say a few words in front of the bench and portrait of Lou that had been brought in for the day there were as many laughs as there were tears. Sharon said during her speech that she hopes people will take time as they sit on the bench, which catches the sunlight for most of the day, to notice the plaque and maybe Google search Louise’s name so that, if they weren’t ever lucky enough to meet her, they can at least get a feeling for what a wonderful woman she was. Truly, we were lucky to have Lou in our lives, and hopefully the stories of her, as well has these wonderful mementos, will keep people smiling for years to come. And that’s also what Nottingham Roller Derby hope for with the Louisey Rider Cup. That Lou’s friends have a space to gather once a year – around the time of her birthday – and celebrate her. But also so people who didn’t know Lou can join in this celebration of her life. That they come for the legendary afterparty, the glitter, the Nutella eating championship and the lip sync battles but as they attend, whether as a skater, official or spectator, they stop awhile and find out a bit more about our friend Louise and the things that made her so special. So if you’re thinking of coming to the Louisey Rider Cup, even if you didn’t know Louise personally, we welcome you. Come and learn about our beautiful, vivacious and hilarious friend, as we intended – and if the mood should take you, head over to the bench just off the corner of Pennyfoot Street and Lower Parliament Street and sit awhile. This entry was posted in Blog and tagged LRC by Kat Chmee (ed). Bookmark the permalink.